Our response to a funding request in front of Bainbridge Island City Council for The Tyler Moniz Project and their partner, The Coffee Oasis is linked below. This statement will be presented at the December 11, 2018 Bainbridge Island City Council meeting. Join us at the Historic Roxy Theater in downtown Bremerton for mimosas, marys, light brunch, and some amazing drag queens on the stage. Your $20 ticket includes your first mimosa and our signature light brunch – because calling it Drag Queen Continental Breakfast doesn’t have the same ring. Please buy your ticket early (click here). A $30 VIP ticket has front-row or early entry pick of seating, light brunch and an extra Mimosa or Mary. Celebrate Winter Pride at our inaugural Art Show celebrating queer artists. We will have a live DJ, cash bar (with ID), and great art. 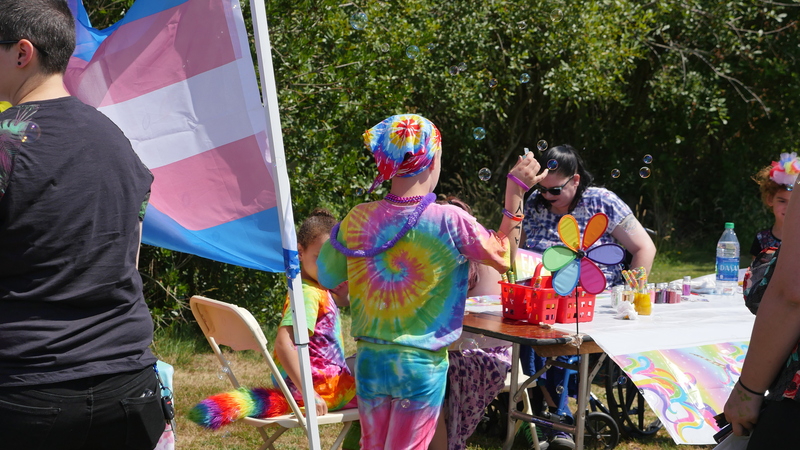 Our Transgender Day of Awareness event is sponsored by Bainbridge Pride and Kitsap Pride and will be held at the Bainbridge Island Museum of Art on Sunday, November 18 at 4pm. Save the date for Kitsap Pride 2019! Saturday, July 20 at Evergreen Park in Bremerton. View the Festival Page Here! Kitsap Pride Network is pleased to announce that Kitsap Pride 2018 will be held on Saturday, July 21 from 11 a.m. to 5 p.m. at Evergreen Rotary Park in Bremerton, Washington! We are working on building on the excellent reception for our 2017 event bringing back everything that worked and trying out some new things which we hope will get you excited! We are working on more family friendly events for kids of all ages, more community stage realness, and some fun community events leading up to Pride to get us all ready for the big day. Kitsap Pride and Bainbridge Pride present the Pride Interfaith Service, Sunday, July 15 from 4:30 p.m. to 6:00 p.m. at the Suquamish Church of Christ, 18732 Division Ave NE, Suquamish, Washington. Join us at Pints for Pride! We’ve teamed with four local independent brewers for fun evenings to celebrate Pride. We’ll be hanging out from 6-9 at each event and the brewers will donate $1 for each pint sold to Kitsap Pride.